Lance Serjeant Geoffrey Goodall Tozer, Royal Sussex Regiment, died 4 August 1916, aged 23. The son of Soloman and Helenora Adair Tozer, of Ashburton, Devon. Geoffrey was born in Ashburton in 1893 and his birth was registered in Newton Abbot in the third quarter of 1893. The 1901 census for Eastbourne in Sussex shows Geoffrey as a boarder in a boarding school for boys; he is 7 years of age. The 1911 census for Haslemere in Surrey shows Geoffrey as a boarder aged 17, living at West View, King's Road, Haslemere, and he had no occupation. Geoffrey chose to change his name to Gerald Seckham and enlisted into the 7th Battalion Royal Sussex Regiment in Ely, Cambridgeshire. He joined as a private and his serial number was G/5430. The 7th Battalion formed in Chichester, Sussex on the 12th August 1914 as part of Lord Kitchener's new armies. They moved to Shorncliffe in October 1914 and then to Folkestone in December 1914. In March 1915 they moved to Aldershot, and then landed at Boulogne on the 1st June 1915. Gerald actually landed in France on the 17th August 1915; he rose to the rank of acting lance sergeant during his short career. The 7th Sussex was involved in the Battle of Loos 25th Sept – 8th October 1915 and the action of the Hohenzollern Redoubt 13th – 19th October 1915. They were at the Battle of Albert 1st – 13th July 1916 and the Battle of Pozieres 23rd July 1916. Gerald was killed in action on the 4th August 1916, and he is remembered on the Thiepval Memorial and the Ashburton War Memorial. Gerald (Geoffrey) was the son of Solomon and Helenora Adair Tozer of Ashburton. John was born about 1886 in Ashburton, and his birth was registered in Newton Abbot in the 3rd quarter of 1886. The 1891 census for Ludbrook House, Keaton Lane, Ermington, Ludbrook, Devonshire records the family living there, with head of the family John. He was born in Ashburton in 1822, is aged 69 and has no occupation. No mother is recorded on the census. John Henry is aged 4, and his younger brother Dugald is aged 3, and he was born in Ashburton. The 1911 census for East Street ,Ashburton records John Henry as a lodger in the Golden Lion Hotel, East Street. He is single, aged 24 and living on private means. Records show that John married in London in 1911, and the marriage was registered in St George, Hanover Square in the 3rd quarter of 1911. He married either Frederica Diesch or Florence M Clarke. John Henry's medal index card only confirms that he qualified for the 1915 star and British War Medal and Victory Medal, which would indicate that he trained prior to 1915 or joined in 1915 and then was sent to war. His card has not been filled in to record a theatre of war. John Henry died whilst serving as a Lieutenant in the Royal Army Service Corp in India on the 3rd August 1917. He is remembered on the Kirkee 1914-1918 Memorial and also on Ashburton War Memorial. John's widow was living at 19 South Street, Thurloe Square SW7 when she applied for John Henry's medals. Thomas was born in Denbury near Newton Abbot on the 16th October 1897 and his birth was registered in Newton Abbot. The 1901 census for Highweek, Newton Abbot shows the family living at Cottages, Ash Hill, Highweek, Newton Abbot, with head of family Thomas Tozer. He was born in 1867 in Torbryn in Devon; he is employed as a horseman on a farm. Sarah Anne is Thomas Lewis's mother and she was born in Ottery St Mary in 1867; she is at home tending the house. The 1911 census for Bickington shows the family living in Goodstone Cottage, Bickington; Thomas Tozer is still employed as a horseman, and Sarah Anne is still looking after the house. Thomas Lewis and his brother Cecil John, born 1907 in Ash Hill are scholars, and a daughter has been born in 1911. She is Edith Ellen Caroline and she was born in Goodstone. I have Thomas Lewis's service record and it shows that he joined the Army Reserve between the 21st February 1916 until the 28th August 1916, at which point he enrolled into the Royal Navy Division. Thomas joined the Howe Battalion in the Division and he was attached to a reserve battalion; on the 28th November 1916 he was promoted to the rank of AB. On the 4th December 1916 he was drafted to Howe Battalion BEF (British Expeditionary Force). On the 7th March 1917 he was hospitalised, and on the 5th March 1917 he rejoined his battalion. On the 24th April 1917 Thomas was killed in action during the second Battle of the Scarpe, probably during the action to capture Gavrelle between the 23rd and 24th April 1917. Thomas's father, still living at Goodstone Gate, Bickington was informed of his death. He would have been able to claim the British War Medal and Victory Medal awarded to Thomas. Thomas is remembered on the Arras Memorial, and also on the Ashburton War Memorial. Many thanks to Bob Shemeld for the above research. 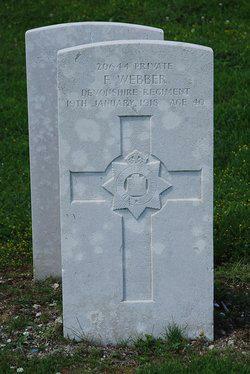 Second Lieutenant Alan Robert Lloyd Tucker, Royal Warwickshire Regiment, died between 18 and 20 December 1914, aged 20. The Son of Robert Edward and Annie Lloyd Tucker, of The Hall, Ashburton, Devon. Alan was born in Ashburton on the 25th June 1894. The first census for Ashburton that Alan is recorded in is the 1901 census, where the family is recorded as living in East Street, Roborough. Robert Edward is Alan's father, born in Ashburton in 1864. His recorded occupation is that of a solicitor. Annie Lloyd is Robert's wife, and she was born in Anglesey, North Wales. Alan is aged 6, and there is a daughter named Margaret Doris, born in Ashburton in 1897. The 1911 census confirms that the family is still in East Street, and Alan aged 16 is at school. Alan's father had previously been a Lt Col commanding the 2/5th Haytor Battalion Devonshire Regiment (Territorial Force). Alan's mother Annie was the daughter of the late Richard Williams of Bodafon, Anglesey. Alan had been educated at Sherborne College in Dorset, and at Sandhurst, and he was gazetted as a 2nd Lieutenant in the Indian Army on the 8th August 1914, and was subsequently attached to the 2nd Battalion Royal Warwickshire Regiment. Alan was part of the British Expeditionary Force which were sent to France in 1914, and he arrived in France of the 23rd November 1914, less than one month later Alan was killed in action between the 18th and 20th December 1914. The first battle of Ypres had just finished and the British forces had lost many soldiers in action; reinforcements were being brought in from England to bolster the depleted number of troops. The war diaries confirm that on the 18th December 1914 an attack by the 22nd Brigade, of which the 2nd Warwickshire Regiment was a part, were brought into action in Wells Farm at Boutillerie and considerable losses were encountered. This is probably the action in which Alan lost his life between the 18th and 20th December 1914. Alan is remembered on the memorial at Ploegsteert on panel 2 and 3. Alan's father, who was still living in East Street, claimed his son's medals in 1920, and he would have received Alan's 1914/5 Star, the British War Medal and Victory Medal. Alan was not entitled to the 1914 Star as he did not qualify for this star by about one week. The Commonwealth War Graves Commission records Alan's father as living at the Hall, Ashburton, however this is incorrect. Please see the article on this website reference the Tucker families. Many thanks to Bob Shemeld for the research above. Major Henry Humphreston Scott Vaughan, RFA, reported killed May 1916, in his 39th year. The son of Mr F H J Vaughan of Humphreston Hall, Shropshire, and Ashburton, Devon. Henry was born in Kensington, London, about 1877 and his birth was registered in Kensington in the third quarter of 1877. The 1881 census for Kensington records the family living at No 30 Edwardes Square, Kensington, with head of family Henry Francis John Vaughan born 1841. He is married to Mary Dorothea Scott Vaughan born 1850 in Marylebone, Middlesex. The parents have a second son, called John C F D, and he was born in 1879 in Kensington. The 1911 census records Henry aged 33 serving as a Lieutenant in the 89th Battery, Royal Field Artillery in India. It is unclear when Henry enlisted into the army, but what is clear is that he served in the British Expeditionary Force in 1914, and he qualified for the 1914 Star. He was serving as a captain in the RFA in 1914. Henry was mentioned in dispatches (MID) in 1916 and this award appeared in the London Gazette on the 15th June 1916. Henry was killed in action on the 24th April 1916, aged 39, and at the time of his death he was serving as a Major in the 83rd Battery Royal Field Artillery. Henry was the son and heir of his father, Henry F J Vaughan BA. Sci (Oxon), Lord of the Manor of Humphreston, Shropshire. Henry is remembered at Poperinghe New Military Cemetery and also on Ashburton War Memorial. Henry's father was living at the Rosary, Ashburton, when he applied for his son's 1914 Star on the 30th November 1917. Thomas Cocking was born in St Ives, Cornwall, on the 4th May 1897 to parents Thomas and Nancy, and his birth was registered in Penzance in the 2nd quarter of 1897. The 1901 census for St Ives records the family living in Meadow Street, and Thomas (senior) is head of the family. He was born in St Ives in 1864 and was employed as a fisherman. Nancy, his wife, was born in St Ives in 1865 and she is looking after the family. Apart from Thomas Cocking there are three daughters all born in St Ives: Nancy born 1887, Mary Ann born 1892 and Sophia born 1901. The 1911 census shows the family at the same address and Thomas is a labourer. Nancy is with the children, Nancy P aged 19 is a charwoman, Thomas Cocking and Sophia are at school. Two more sons have been born since 1901: William born 1904 and Barnabus born 1906, and a daughter Mabel born 1909. Thomas Cocking joined the Royal Navy Reserve on the 20th January 1916. His service number was 10296DA and he was a deck hand. After training at HMS Vivid 111 he boarded HMS Picton Castle (pennant No SA107), which was a 245 ton steam fishing trawler on loan to the Royal Navy as a mine sweeper. She was built in Middlesbrough by Smith Dock Co Ltd. in 1911. HMS Picton Castle was sailing off the south west coast of England near Dartmouth when she was sunk by a mine laid by the German submarine UC17, commanded by Ralph Wenninger 3 miles south east of Dartmouth. 12 crew members were killed including Thomas Cocking, and his body was not recovered for burial. Thomas Cocking married Esther Bowden in 1917 and their marriage was registered in Devonport in the 1st quarter of 1917. There is a census for 1911 that shows Esther Bowden living in North Street in Ashburton, and this is where she was living when informed of her husband's death. Above: HMS Picton Castle 1917. Photo supplied by Bob Shemeld. Thomas is remembered on the Ashburton Memorial, the Penzance Memorial and also the Plymouth Memorial on Plymouth Hoe. Sydney was born in Widdicombe in the moor (sic) in 1897 and his birth was registered in Newton Abbot in the last quarter of that year. The 1901 census for Devonport shows the family living at 21, Elliott Street, Devonport, and the head of the family is George, born in 1855 in Lydford. His employment is a general labourer. Mary is George's wife; she was born in 1870 in Widdicombe. Elizabeth Jane is the eldest child, aged 10 (born circa 1891 in Manaton); Joseph aged 9 was also born in Manaton, as was John aged 6. Florence Mabel is aged 3 months and she was born in Plymouth. The 1911 census records the family living at 2, Back Lane, South Tawton, near Okehampton: George is a tin miner below ground, Mary is at home, and George is a horseman on a farm. Sydney, James (born 1904 in Devonport) and Florence are at school, and Horace is also recorded, born 1909 in Devonport. Sydney enlisted into the 6th (Service) Battalion Dorsetshire Regiment in Plymouth, and his service number was 2447. He was killed in action on the 11th May 1917. The 6th (Service) Battalion was formed at Dorchester as part of K2; they moved to Wareham and were initially attached as army troops to the 17th (Northern) Division. In March 1915 they transferred to the 50th Brigade in the same Division, and in May of that year they moved to Romsey. On the 14th July 1915 they landed at Boulogne. Sydney is remembered at Arras Memorial; his parents were living at Archeton Cottage, Postbridge, near Princetown at the time of his death. Private Frank Warren, Devonshire Regiment, died 25 September 1915, aged 19. The son of Frank and Elizabeth Warren, of 5, Rock Cottage, Chuley Rd., Ashburton, Devon. Frank was born in Ashburton about 1895 and his birth was registered in Newton Abbot in the last quarter of 1895. The 1901 census for Ashburton records the family living in East Street, Ashburton, with head of family as Francis. He was born in Ashburton in 1868 and his occupation is a maltster. Elizabeth is the wife of Francis: she was born in Lydford in 1867. Herbert is the eldest son, born in 1887 and employed as a seedsman's clerk. Annie, the eldest daughter aged 11, was born in 1890, and Florence aged 9 was born in 1892. Fernley is the youngest son born in 1901: all the children were born in Ashburton. The 1911 census for Ashburton shows the family have moved to Rock Cottages, Chuley Road, Ashburton. Head of family Francis is still a maltster, Frank aged 15 is employed as an errand boy for a baker and Fernley is now aged 10. Two further children have been born, Ernest in 1906 and Hilda in 1909, both in Ashburton. Frank enlisted into the Devonshire Regiment in Devonport and he served in the 9th (Service Battalion). His service number was 12663 and he was a Private. The 9th Battalion landed at Le Havre on the 8th August 1915 and they joined the 20th Brigade 7th Division at Calonnesur-La-Lys. Frank's Medal Index Card (MIC) shows that he entered France on the 25th September 1915 and died on the same day, the day of the Battle of Loos. He is remembered on the Loos Memorial and also on the Ashburton War Memorial. Frank's family would have been able to claim his 1914/15 Star, British War Medal and Victory Medal. Frank's parents, living at 5, Rock cottages, Chuley Road, Ashburton, were informed of his death. Private William Norrish Warren, Devonshire Regiment, died 1 April 1916. In Ashburton churchyard. William Norrish was born in Ashburton about 1882 and his birth was registered in Newton Abbot in the 2nd quarter of 1882. The 1891 census for Ashburton shows the family living at Great Bridge, Ashburton, with head of family William H, born in Ashburton in 1857. His occupation is an agricultural labourer. Irena M born in Totnes is William's mother, and she is looking after the family. William N aged 8 is at school, Florence, the only daughter, was born in Ashburton in 1889, and John H born 1891 was also born in Ashburton. The 1901 census shows the family living at Rew Lea Cottages, Ashburton, but William N is not living with the family. William enlisted into the 9th (Service) Battalion Devonshire Regiment in Exeter, where he was a private with a service number of 20288. The 9th Battalion was formed in September 1914 and stayed in England until the battalion was ordered to France where they landed at Le Havre on the 28th July 1915. On the 8th August 1915 they joined the 20th Brigade 7th Division at Calonnesur-La-Lys. The 8th and 9th Battalions were involved in the Battle of Loos, and in February 1916 both the 8th and 9th Service Battalions were moved to the Somme. William was wounded in action on the Somme and repatriated back to England, where he died of his wounds. William is buried in Ashburton Churchyard Extension, and is remembered on the Ashburton War Memorial. His parents would have been able to claim his British War Medal and Victory Medal. Frank was born in Staverton in June 1878 and his birth was registered in Totnes, Devon. According to the 1881 census Frank aged 3 was living with his parents at Rugadon Cottage in Staverton. Head of the family was Frank's father John, who was born in Staverton in 1841; Frank's mother was Margaret, born in Buckfastleigh in 1850. Parents John and Margaret have two further sons and two daughters: William born 1863, Bessie born 1874, John Henry born 1877 and Margaret bron 1881, all born in Staverton. The 1891 census shows Frank aged 12 as a scholar, living with his family at Lower Wash, Staverton. A further child has been born to the parents, Albert born in 1885 in Staverton. Census records for 1901 record Frank still living with his parents in Staverton, and his occupation is ordinary agricultural labourer. The 1911 census shows Frank aged 33 and single, working as a farm labourer and living in Landscove near Ashburton with his parents. Frank enlisted into the 9th (Service) Battalion Devonshire Regiment in Newton Abbot, and was given a service number of 20664; he was a private. Frank's medal index card does not show when he first entered a theatre of war, but he did not qualify for a 1915 star, so he must have entered France in 1916 or later. The Commonwealth War Graves Commission records Frank dying on the 19th January 1918. There is a newspaper report that he was a prisoner of war but I have not been able to confirm this. However Frank is buried and remembered in Rethel French National Cemetery, and the area of Rethel, until being relieved on the 6th November 1918 by General Gouraud's army, had been 20 miles behind the German frontline; 108 British soldiers have been interred in the cemetery. Frank is also remembered on the memorial at Staverton. His parents were living at Parkfields, Ashburton at the time of his death. Picture supplied by Bob Shemeld, to whom many thanks for the above research. Chief Sick Berth Steward John Whiddon, RN, born Jan 15 1876, died of disease 30 December 1916, aged 40. The son of Mrs. Elizabeth Whiddon, of Globe Arch, North St., Ashburton; husband of the late Catherine Jane Whiddon. John was born in Ashburton in 1876 and his birth was registered in Newton Abbot in the 1st quarter of 1876. Recorded on the 1881 census for Ashburton, the family lived in Cad Lane, Ashburton. Elizabeth Whiddon, John's mother, was born in 1841 in Rattery, and she is employed as a labourer; apart from John she has two other sons, Richard born 1879 and Albert born 1877, both in Ashburton. There are three daughters as well: Bessie born 1871, Annie born 1873 and Emily born 1875, all in Ashburton. The 1891 census records the family at the Arch, North Street, and head of family is John born 1831 Ashburton. He is a general labourer, Elizabeth is at home, Annie is a blanket weaver, Emily is a domestic servant and John is an apprentice baker. Albert is at school. John enlisted into the Royal Navy for twelve years service on the 21st July 1897 aged 21; he trained as a sick berth steward and his service number was 350539. John got married along the way as on the 1911 census he was aboard HMS Cambrian off Australia, and was registered as married. John served on a variety of ships and shore establishments furthering his career; he re-enlisted on the 19th June 1909. John's wife died at Plympton St Mary in 1914.